Cardinal 2018 dated memorial Christmas ornament. 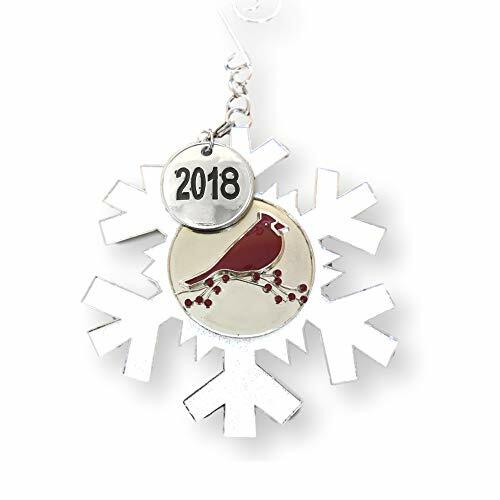 Cardinals are associated with angels from heaven and this snowflake ornament is the perfect way to express this sentiment. 3" diam with a total hanging ht of 5 3/4" L. This is a BANBERRY DESIGNS original design. CARDINAL MEMORIAL ORNAMENT. This is a beautiful red cardinal sitting on birch branches with red berries. The whole design is in the middle of a white, glittery snowflake ornament. Each one has a silver 2018 detachable charm. This is a great ornament for anyone who loves cardinals. REMOVABLE 2018 CHARM. CHRISTMAS ORNAMENT. Dated Xmas ornaments are the perfect gift for anyone who got married this year, had a baby this year, lost a loved one (memorial ornament) or enjoys collecting cardinal decor. WINTER CARDINALS. Cardinals are the perfect keepsake Christmas ornaments. This one of a red bird sitting on a branch is a unique, 2018 design. The white snowflake outline really makes the cardinal pop. .
RED CARDINAL SCENE. Pewter metal ornament with red jewels for the berries and glittery white enamel filling for the snowflake. The decorative S-hook is a nice touch to hang the ornament on your Christmas tree or in a window. This is a nice bird themed Christmas tree ornament. BANBERRY DESIGNS original design. Each ornament is approx. 3" dia. with a total hanging ht of 5 3/4" L. It comes in a nice box for gift giving or storage.